Seventeen hours after the start of the 2014 Bellagio $100K Summer Super High Roller, the tournament came to a close when the last four players decided to chop the remaining prize pool according to figures suggested by ICM (Independent Chip Model). Dan Smith, Jason Mercier, Tom Marchese, and Jason Somerville — the last men standing — decided to divide the entire remaining prize pool and forgo the custom of holding back a certain amount for which to play for since they weren’t playing for a trophy. While no there was no trophy, there were still Global Poker Index points to consider. That issue was easily solved when the players decided to just be placed in the order of their chip amounts. So “official” congratulations go out to Dan Smith who thanks to having the largest chip stack at the time of the deal technically won the tournament. Originally scheduled to be a $10K event, a group of players convinced tournament staff that if the event were changed to a "super high roller" with a $100K buy-in, they would get a better turnout — and a great turnout is exactly what they got. As players and the media took to Twitter, the word got out and many of the big names made it over to Bellagio to get in on the action. A total of 66 players ultimately entered the tournament with 21 of them re-entering. The 87 total entries thereby created a prize pool of $8,613,000 with $2,842,290 originally scheduled to go to the winner. The road to the final table was filled with aggressive play and a lot of action. A few notable players who made an appearance at Bellagio but did not get paid for their efforts included Phil Hellmuth, John Juanda, Phil Galfond, Brian Rast, Sorel Mizzi, Daniel Alaei, Fabian Quoss, Martin Finger, and Philipp Gruissem. 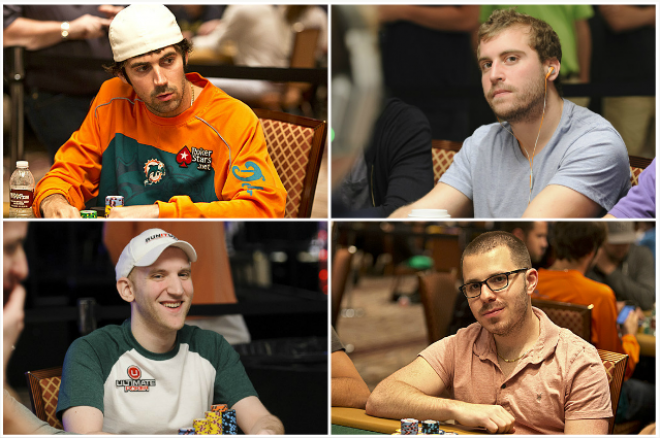 David “Doc” Sands ($172,260) and Pratyush Buddiga ($172,260) were eliminated in 11th and 10th place, respectively, to set up an official final table that included Chris Klodnicki, Gabe Kaplan, Doug Polk, Adam Bilzerian, Matty Hyman, Somerville, Marchese, Mercier, and Smith. 4-way all in: Matt Hyman (nines), @ChrisKlodnicki (kings) Adam Bilzerian (aces) and @GabeKaplan (tens). Hyman gets quads. No elimination. Adam Bilzerian eliminated in 7th for $344,520. Both Bilzerian and @DougPolkPoker had an ace but Polk’s kicker played. Polk sits with 4.2M.
.@dansmithholla (queens) eliminates @DougPolkPoker (ace-four clubs) in 5th place. Smith has ~10M. The players are now looking at numbers. Because PokerNews wasn’t scheduled to cover this event, it was decided to live tweet updates. If you are interested in reviewing the Twitter feed for this tournament, use #Bellagio100K when searching. Bellagio $100K Summer High Roller Draws 87 Entries; $2.8 Million to the Winner!